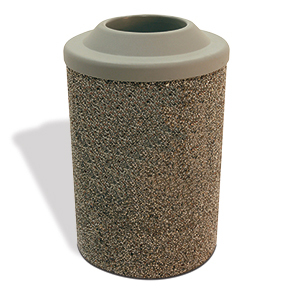 Help keep community spaces neat and inviting, concrete waste receptacles offer a durable waste management solution. Most often installed in landscapes to provide solid heavyweight performance with a high volume ready polyethylene lid, large capacity and built for just about any climate its easy to understand why. Pitch-in lid allows hands-free disposal with 360 degree access designed to conceal and contain contents, the convex shape discourages litter collection on the lid. Made from durable polyethylene, this lid is easy to keep clean and will not dent, chip, stain, fade, rust or corrode. The natural strength and durability of ASTM compliant concrete reinforced with steel rebar provides exceptional long term service. Available in many standard and premium finishes to suit landscape aesthetic.